Workers at a factory is Greenfield won a new union contract, and environmental activists permanently protected 323 acres of land in the Valley from development. “We are very pleased with the contract we ended up with,” Jay McGrath told the Valley Post in a July 18 interview. He is one of 74 workers at the Kennametal factory on Sanderson Street in Greenfield. McGrath started working at the Greenfield factory 17 years ago. The workers have a union, which has a web site at www.UEunion.org. In the past several months, the union held several well-attended rallies in Greenfield that helped the workers win a good contract. The workers make taps – not the kind used to turn water on and off, but the kind used to make a threaded hole in metal, or in other material. The factory is owned by Pennsylvania-based Kennametal Corporation, whose CEO makes more than $1 million a year. 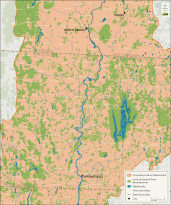 The town of Swanzey, New Hampshire borders Keene and is a few miles from Massachusetts and Vermont. On July 14, a local land trust announced it had saved 66 acres of farmland in Swanzey from development. The land trust has a web site at www.MonadnockConservancy.org. In the town of Wendell, Massachusetts, near Greenfield, 48 acres of land were saved, a land trust announced on July 13. The land trust has a web site at www.MountGrace.org. On June 28, the Vermont Land Trust announced in an e-mail to its members it had saved 209 acres of forestland in Marlboro, Vermont, which borders Brattleboro. Most people who live in rural towns in the Valley need a car to get to work or school, and to go shopping, or visit friends. Garmisch is a town in Germany with a population of about 26,000. It is surrounded by tens of thousands of acres of farmland and mountains covered in forest and criss-crossed by hiking trails. Almost every home in the area is within walking distance of downtown stores and offices, schools, and the train station, which has hourly fast service to other small towns and to the nearest big city, Munich. For this reason, people who live in Garmisch – and in most rural areas of Europe – don't need to own a car. Cars cause climate change. Protecting open space is one way to encourage people to live in places like downtown Northampton or Brattleboro, where you can live without a car. In New York City and Boston, millionaires live in apartments. In addition to floods, climate change causes droughts. In Africa, droughts mean people starve. On July 17, the United Nations said 20 million people might die of starvation this year in "the worst humanitarian crisis since World War II." The people are in Yemen, Somalia, South Sudan and Nigeria. People can donate to relief efforts at www.GlobalEmergencyResponse.org.